Shawn "JAY Z" Carter, Los Angeles Mayor Eric Garcetti, Live Nation CEO Michael Rapino, Budweiser and United Way of Greater Los Angeles are bringing the spirit of “Budweiser Made In America,” to Los Angeles during the 2014 Labor Day weekend. 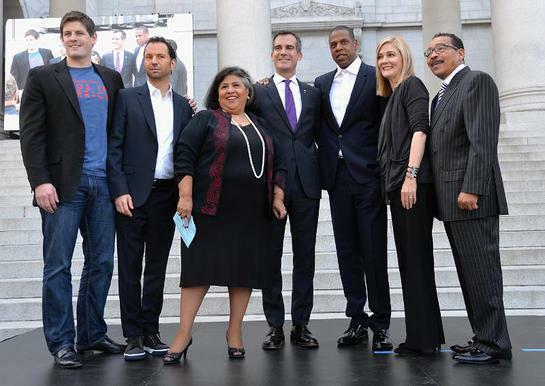 Budweiser Vice President Brian Perkins, Live Nation's Michael Rapino, LA City Supervisor Gloria Molina, LA Mayor Eric Garcetti, JAY Z, United Way's Elise Buik and LA City Council President Herb Wesson. The two-day music festival began in Philadelphia on Labor Day weekend 2012 to benefit United Way of Philadelphia and Southern New Jersey and United Way of Lancaster County, and this year will deliver twice the amount of music. Live Nation will produce both the Philadelphia and Los Angeles two-day music festivals, delivering must-see performances on both coasts. Details and lineups for both festival locations will be announced at a later date. “Budweiser Made In America” will be the first American festival to run simultaneously on both coasts. Performances from both “Budweiser Made In America” sites will be available for fans to view with live-streaming. With the addition of the west coast festival, JAY Z, Live Nation, Budweiser and United Way are committed to improving lives and strengthening local communities in Los Angeles County. United Way will invest the funds raised to ensure more people have the opportunity to reach their potential — through quality schools, good jobs and stable housing. The “Budweiser Made In America” Festival provides the perfect crescendo to summer and coincides with the culmination of “Summer of Success,” a multi-pronged approach by Mayor Garcetti to advance youth during the school break by providing them jobs, learning opportunities, and extended programming at City of Los Angeles parks and recreational facilities. Budweiser, JAY Z and this festival embody the American spirit and enhance the ongoing partnership between the United Way of Greater Los Angeles, and the City of Los Angeles. The Philadelphia site will benefit United Ways in Greater Philadelphia and Southern New Jersey and Lancaster County, Penn. The primary goal of this music festival is to have a positive impact on the communities involved. As a result, the money invested into these communities will positively impact the education, income and health of the most vulnerable and needy citizens in these regions. As a result of last year’s “Budweiser Made In America” Festival, United Way of Greater Philadelphia and Southern New Jersey is investing $300,000 in education and talent development initiatives to enhance cradle-to-career education that ensures all students graduate high school, college and are career-ready, and equips individuals with the job skills and training they need to secure work that provides a family-sustaining income. The festival also enabled United Way of Lancaster County to invest an additional $100,000 in programs and services that support learning success across the education continuum. WHERE: The Los Angeles “Budweiser Made In America” Festival will take place on Grand Park in downtown Los Angeles. The Philadelphia festival site will remain on the Benjamin Franklin Parkway. TICKET PURCHASE: 2 Day Early Bird tickets are available now at www.livenation.com. 2 Day Early Bird tickets for Philadelphia are $99.50 and Los Angeles are $125. Additional on sale information will be announced. The festival’s site, www.madeinamericafest.com will be updated with general information.